LENEXA, KS. – The annual Kevin Lane scholarship has been awarded for the second time to University of Kansas student, Patrick Canny. The scholarship is in honor of the late Kevin Lane, who worked as an electrical foreman at P1 Group for more than 27 years. As a sophomore this year, Patrick recently visited P1 Group’s headquarters. He has made some big changes in his life since he stopped by last year. After working a summer internship at an aerospace engineering firm, he wondered if a degree in mechanical engineering was the right choice for him. A friend working in New York at a medical lab then inspired him to consider pursing computer science. A few programming classes later, Patrick decided that exploring a career in data science would give him the freedom to fully reach his potential. LAS VEGAS, Nev. - Liz Ferguson is the recipient of the August 2016 PRIDE Award, which is a part of P1 Group’s Commitment to Excellence program. She is a Project Engineer who has worked out of the Las Vegas office for almost two years. Whether she’s assisting project managers with their daily tasks or helping an Estimator get a bid out the door, her attention to detail is impeccable. Liz puts a tremendous amount of pride into her work and consistently goes above and beyond to get the job done. She is conscientious and takes the time needed to ensure her work is correct and accurate. Her diligence makes processes flow much smoother. Greg Sweeney gave the safety talk. 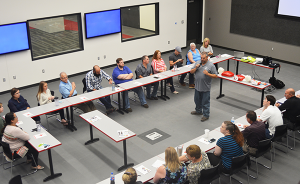 LENEXA, Kan. - P1 Group Lenexa office associates had their first Quarterly Safety Meeting this week, providing them with the opportunity to learn more about P1 Group’s commitment to a “Safety First, Quality Always” culture. Ingram’s, a Kansas City business magazine, has ranked P1 Group 62nd on its 2016 list of the 100 Top Private Companies in the Kansas City region. The list was published in Ingram’s June issue. To compile the list, Ingram’s ranked companies by 2015 revenues. P1 was ranked 62nd in 2015, 64th in 2014, 69th in 2013 and 73rd in 2012. Contractor magazine’s annual Book of Giants has ranked P1 Group, Inc. 24th among the nation’s top 100 mechanical contractors. P1 Group also made the list of ten largest mechanical contractors in the Midwest. Darin Mason, center, accepting his award with his wife, Amy, and Mark Pottorff, Training Director at Topeka Electrical JATC. A P1 Group electrical apprentice won the 2016 IBEW 7th District/ NECA District V Outstanding Inside Apprentice award. And not only did Darin Mason win the contest on March 21 in Tucson, Ariz., he set a record. LENEXA, Kan. - Twice a year, P1 Group employees come together to nominate for recognition those that best exemplify P1 values. This week we are proud to announce the recipient of the Innovation Award, Jeff Peterson. Jeff is a Mechanical Estimator that has been with P1 Group for almost 15 years. He has been instrumental in recent upgrades to our estimating program. Jeff has led the charge on setting up and training Estimators and Project Managers on the Accubid Enterprise system. He has developed a single estimating system platform that the P1 construction and service departments can both use, which is tailored to each department, yet integrated together. 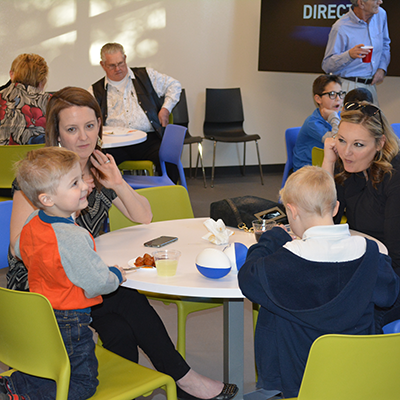 LENEXA, Kan. - P1 Group showcased the new corporate headquarters building at an Open House on January 14. Family, friends and P1 associates from other locations attended the event, which featured informal tours of the building and refreshments in the building’s Gathering Space. P1 Group moved into the new building, located at 13605 W. 96th Terrace in Lenexa, on November 16. It is a modern, non-traditional office space that was designed as a hybrid of traditional sheetrock wall construction and open office planning. P1 Group has been named a Top 100 Specialty Contractor by the Engineering News-Record (ENR) for the third consecutive year. P1 Group was ranked 86th this year, surpassing the company’s 88th and 100th place rankings in 2014 and 2013. The ENR list combines 15 categories of specialty contractors and ranks them by annual revenue. The contractors listed had combined revenue of $93.20 billion, up 5.6% from $88.13 billion last year. The mechanical and electrical trades accounted for 52 percent of the total revenue. KANSAS CITY, Mo. 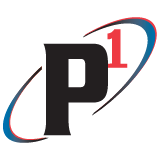 – P1 Group, Inc., was recently ranked 34th on the Kansas City Business Journal’s list of the Top 150 Private Companies. The list ranked Kansas City-area private companies by 2014 gross revenue. P1 Group reported record revenue in 2014 – $223 million. Last year, P1 Group ranked 39th on the list.